The Unconventional CEO Shares Her Journey of What It’s Like to Lead a ‘Benefit to all, Harm to None’ Bank. In the feature story, Meet The Woman Beating the Big Banks At Their Own Game, Conscious Company spotlights how Beneficial State Bank stands out from other banks, why Taylor chose to change the world through banking, and what lessons she has learned along the way. We consider banking to be the original and most powerful form of crowdfunding. We all pool our deposits so that we can finance the communities and world in which we want to live. 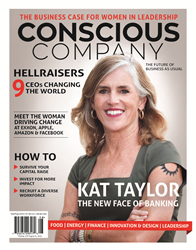 Co-CEO and Co-Founder of Beneficial State Bank, Kat Taylor, makes the cover of Conscious Company magazine’s 2016 July/August issue. In the feature story, Meet The Woman Beating the Big Banks At Their Own Game, Conscious Company spotlights how Beneficial State Bank stands out from other banks, why Taylor chose to change the world through banking, and what lessons she has learned along the way. Taylor, a mother of four, shares how her upbringing inspired her to fight for economic justice and take on the banking industry. Beneficial State Bank has the ambitious goal of providing transparent banking products and services that are fair to communities with the least amount of bargaining power – all while attempting to change the banking system for good. Conscious Company’s 8th issue focuses on “the future of business as usual” by showcasing women who are innovative changemakers including Natasha Lamb of Arjuna Capital, Energy Excelerator's Dawn Lippert, award-winning architect Sarah Wigglesworth, Brook Eddy of Bhakti Chai, and Kiverdi's Lisa Dyson. Founded by two millennials, Meghan French Dunbar and Maren Keeley, Conscious Company, a certified B Corporation, is the first nationally distributed publication in the US to focus solely on sustainable business and Business as a Force for Good. Based in Boulder, CO, the publication first hit stands nationwide in January 2015. With four issues that year and moving to a bi-monthly production schedule in 2016, the publication has quickly become a leading source of information for and about sustainable businesses. Beneficial State Bank is a social enterprise bank founded in 2007 with a triple bottom-line focus of social justice, environmental resilience and economic sustainability. Beneficial State is a state-chartered, federally regulated, for profit banking organization whose economic interest is owned entirely by a non-profit foundation of the same name. Beneficial State is mandated to produce meaningful social justice and environmental benefits in an economically sustainable manner. In December 2010, it acquired ShoreBank Pacific. The merger greatly expanded the Bank’s reach on the West Coast, and enhanced its capacity to serve its mission. ShoreBank Pacific, a pioneer of environmentally sustainable banking, served both Washington and Oregon. The joint forces produced an enlarged footprint covering a bio-regional territory some call the Salmon Nation and united the synergies of social justice and ecological banking. A few years later in October 2013, Beneficial State Bancorp completed a stock purchase transaction of 90% of Albina Community Bank, bringing a Portland-based community bank that has been investing in individuals, families, businesses, and local neighborhoods for over 20 years, into their family. In June of 2016, Beneficial State Bank acquired Pan American Bank. The combined 12-branch network now serves the California communities of Oakland, Santa Rosa, Sacramento, Los Angeles, Bakersfield, Fresno, Porterville, Visalia, Modesto and additionally Portland, Oregon and Seattle, Washington.